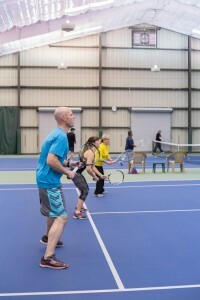 Group Tennis– Come and join our tennis staff at Group Tennis-an adult, beginning level tennis class that teaches the fundamentals of tennis from strokes, strategies, scoring, and rules. Group Tennis meets Wednesday evenings at 7:30 and Saturday mornings at 10. 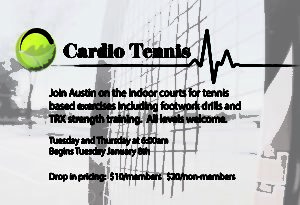 All adult members are welcome, and racquets are provided. Included in your membership. , to find a team at the level that is right for you. Adult Drop-In Clinics – The best way to meet new players, get a great workout and improve your game. All adult players are welcome to join at any time. If you are unsure of your level, contact the tennis department prior to your arrival. Clinics are 90 minutes and cost $12. Meet you on the courts! Senior Drop-In Round Robin – Meet new friends and start your day with a tennis match. This is a rotating doubles format for all levels. Senior Drop-In meets Tuesdays and Thursdays 7am-9am. Men’s, Women’s, and Mixed Club Leagues – Scattered throughout the year, these leagues are less competitive than USTA leagues, but designed to offer practice opportunities in a social atmosphere. Check the tennis bulletin board in the lobby for sign-ups. Clinics are instructional with focus on technique and tactics. Drill offers the opportunity for players to practice their technique and tactical play with greater intensity. This format is less instructional than a clinic session but will have a faster pace for a good practice. We offer half hour or hour private lessons for individual or groups. These lessons are a great way to spend some concentrated time with one of our teaching professionals working on a specific area of your game.